Midnight Rambler is located in the basement of the Joule Hotel. 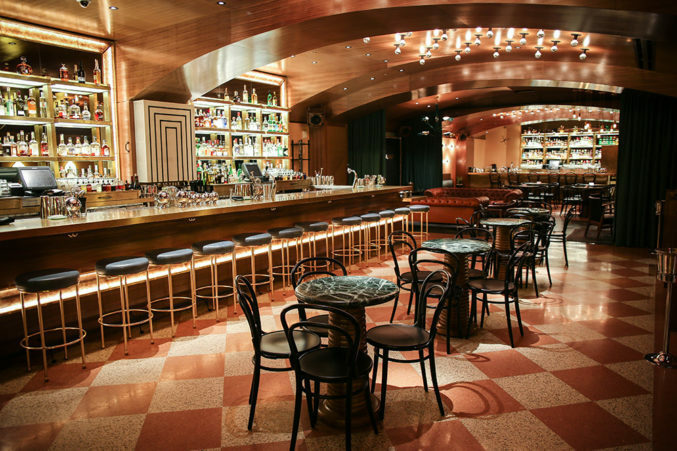 The cocktail den was designed by the team behind trendy boutique — also located in the Joule Hotel — TenOverSix. The aesthetics are as curated as the drinks. The vibe is ’60s chic and the space is filled with brass bar stools, plush leather couches, vintage-looking (and actual vintage) tables, books, records, art and plants. The cocktail menu is expansive. The tiny booklet is filled with pages of original, sometimes tongue-twisting, recipes. A selection of food from CBD Provisions is offered until midnight, and includes a house-made charcuterie, whole hog Cuban, chicken liver mousse and a variety of ice cream sandwiches. Midnight Rambler is open from 5 p.m. until 2 a.m. seven nights a week.